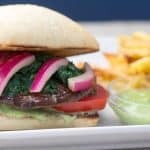 This vegan air fryer portobello burger is everything you want in a burger: flavorful, juicy, messy! Prepare marinade in a small bowl by whisking together balsamic vinegar, olive oil, lemon juice, mustard, and salt. Place mushrooms in a large resealable plastic bag. Pour in marinade, seal bag, and toss to coat thoroughly. Let marinate for 30 minutes, turning once halfway through. Add portobellos to air fryer basket and cook at 370 degrees for 7 minutes. Meanwhile, combine pesto and mayo spread on toasted bun. Build your burger just the way you like it. And don't be afraid to switch the toppings! Enjoy!